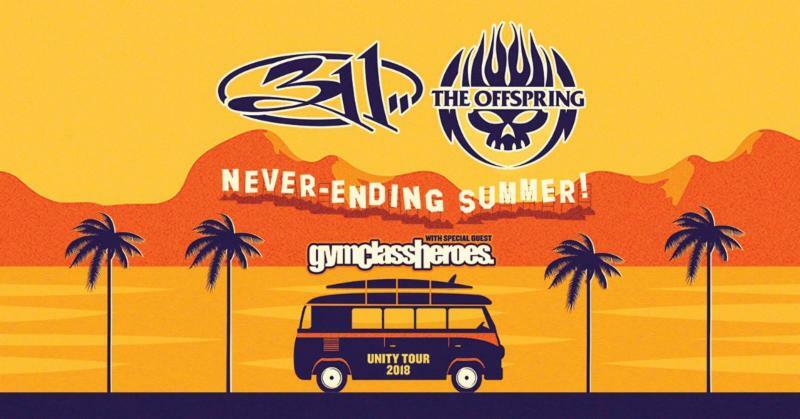 LOS ANGELES (April 9, 2018) – Two of rock’s most notable live bands, 311 and The Offspring, announced they are teaming up for the Never-Ending Summer Tour, a fun-filled summer amphitheater outing with special guests Gym Class Heroes. The tour will also make stops at select regional events throughout the summer. See below for itinerary. Gym Class Heroes broke into the scene in 2005 with their debut The Papercut Chronicles, a classic coming-of-age album that spawned the platinum, record-setting Top 40 No. 1 single “Cupid’s Chokehold/Breakfast in America.” Papercut served up a fresh, new palette for hip-hop: live instruments, slyly humorous lyrics, and eerie melodies that illuminated rapper Travie McCoy’s dark, personal subject matter. Since then, Gym Class Heroes has established themselves as one of the most exciting bands in pop music, topping the radio charts with hit singles, touring the world, making countless national television appearances, and winning multiple music awards, including the MTV VMA for Best New Artist in 2007.